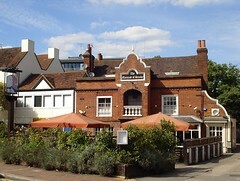 Castle (Mitchells & Butlers) pub in Epsom. It was refurbished in early 2017. It's relatively large inside, but divided into several different cosy little areas. Seating is a mix of small sofas, comfortably-padded banquettes, and freestanding chairs. Floors and bar are wooden, the walls are half-panelled, and ceiling beams are exposed. Lighting is a mix of standard lamps and wall/ceiling mounted. There's a large outside seating area at the front, and another smaller area of decking at the back. We've visited a few times now, most recently in July 2017. When Elvum, Northern Steve, and bob visited on a very hot Thursday evening in July 2009, the pub was thankfully air conditioned around the bar area, and was pleasantly cool in other areas as well. They were having a cider festival at the time, so Old Rosie and another cider were available from polypins and they supposedly had a range of bottled ciders as well. These may not be present during normal times. They had London Pride and Doom Bar on which were both fine. They also had quite a large range of lagers on. When Kake visited again on a Friday afternoon in August 2012, there were three real ales on: London Pride, Doom Bar, and Wharfebank VPA (£1.80/half). The VPA was well-kept. There were quite a lot of people in, though it was sunny so most of them were sitting outside. Music was playing, though not too loud; a mix of folksy and Sinatra-ish. On Kake's Tuesday afternoon visit in July 2017, the outdoor seating areas were both well-populated, and there were very few other customers inside. Music was playing — a fairly interesting selection including the Cocteau Twins. Two of the four handpumps on the bar were on, clipped for Harviestown Summer Legend and Wimbledon Common. Food is served all day from a fairly standard menu photo as of July 2017. They also do sandwiches photo of menu and bar snacks photo of menu. In July 2017, Kake tried a starter of calamari with nduja mayo (£5.75) photo. It arrived lukewarm, and very quickly — much too quickly to have been cooked fresh. The batter was crisp and well seasoned, but the squid was chewy. The watercress salad on the side was quite tired, and actually wilted in places. The best thing about it was the nduja mayonnaise, which was both a good idea and well-executed. According to their Twitter account as of June 2017, quiz night is every Tuesday from 8pm. Accessibility: No steps to get in, just a ridge at the threshold. Once you're in, it's step-free to the bar and much of the seating. Some of the seating is down a step at the back; this area also leads to the gents' and a RADAR-locked accessible toilet. The ladies' is up a flight of stairs with a couple of bends and non-continuous sturdy handrails most (but not all) of the way up on both sides. The ladies' cubicles are quite a squeeze to get into; the gents' are much more spacious. Last visited by Kake, July 2017. Opening hours taken from the Marquis of Granby website, July 2017. Last edited 2017-07-30 16:33:58 (version 9; diff). List all versions. Page last edited 2017-07-30 16:33:58 (version 9).